Flush with the success of striking a deal that allows him to get away with the gas murder of over a thousand people by promising never to do it again, Syrian President Bashar al-Assad has joined his on-going military offensive with a "charm" offensive in the West. Mother Agnes-Mariam de la Croix, a Carmelite nun from the Monastery of St James the Mutilated in Syria, is touring the United States and speaking wherever they will have her. She is a well known Assad regime propagandist who abuses her religious credentials for credibility. I have written about her before and will have more to say near the end of this piece. A number of famous and lesser known US Leftists, who had taken the road to Damascus and been given the guided tour, have also been travelling the United States and singing Assad's praises. They include Cynthia McKinney, former congressperson and Green Party presidential candidate, Ramsey Clark, former US Attorney General and current Worker's World Party leader, Dedon Kamathi, KPFK Pacifica radio host, and John Parker and Sara Flounders from Ramsey Clark's International Action Committee. When they came to Los Angeles, members of the opposition Syrian American Council were there to make sure the revolution's viewpoint was represented and they plan to be there to greet Mother Agnes-Mariam when she speaks in Los Angeles this Saturday. Satuday's edition of Mother Agnes-Mariam "North American Speaking Tour" starts at 7:00PM and is titled "What is Really Happening in Syria Today?" and is to be held at Jesus Sacred Heart Church, 10837 Collins St, North Hollywood, CA 91601. Her tour is being sponsored by the Syrian Solidarity Movement and this Los Angeles appearance is being hosted by Arab-Americans For Syria. Syrian Solidarity Movement is 501c3 non-profit based in California and run by Paul Larudee, an Iranian born US political activist. He is a former Ford Foundation project supervisor and a US government advisor to Saudi Arabia. He is also an organizer with the International Solidarity Movement in Palestine and one of the founders of the Free Gaza movement. In May he led an international delegation to Damascus that was suppose to include Dennis Kucinich, and did include writer Franklin Lamb, Nobel Peace Laureate Malread Maguire, Michael Maloof of World Net Daily, and 16 others. The U.S. will attempt to coerce or overthrow any independent-minded government, but an autocratic regime has a better chance of resisting because its repressive apparatus will crush dissidence before it has a chance to breathe. Paul Larudee completely supports Assad's attempts to crush dissidence. So just be clear on this point - fascism does have its supporters - and this tour is being promoted by supporters of fascism. Which brings us to the group which I think of as Assad's equivalent to the German-American Bund which was so opposed to intervention and so supportive of Hitler just prior to US involvement in World War II. At first, Ray sounds reasonable. He calls for peace and dialogue. “A dead Sunni, a dead Shi’ite and a dead Christian all smell the same after three days,” he says. But his repeated and impassioned insistence that his rivals are “al-Qaeda sleeper cells; Wahhabis who consider me an infidel” fails to stick. The Syrian American Council represents that opposition in Southern California and they are not al Qaeda. SAC was founded in 2005 and is the largest Syrian-American community organization in the US with 19 chapters nationwide. 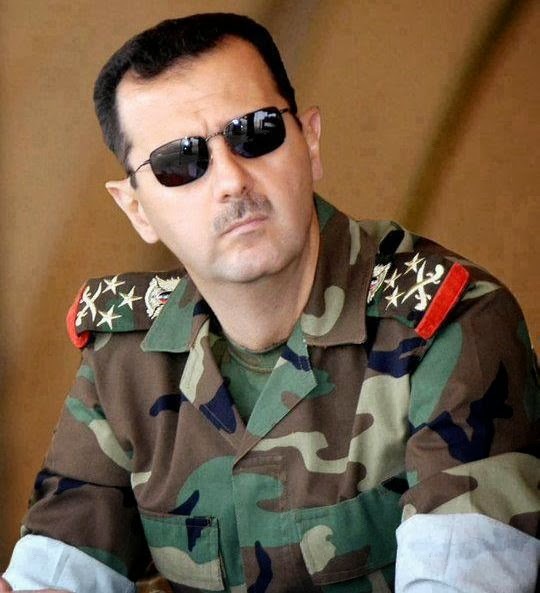 It has come out solidly in support of the revolution and in opposition to the Assad regime. The Los Angeles chapter has been growing and ramping up its activities. Recently it is starting to step up its activities. Opposing the vicious Assad regime is not without its special dangers, even for Syrians as far away as California. After pianist Malek Jandall performed a Syria benefit concert in Los Angeles, his parents were attacked in Homs, Syria and their home was sacked. 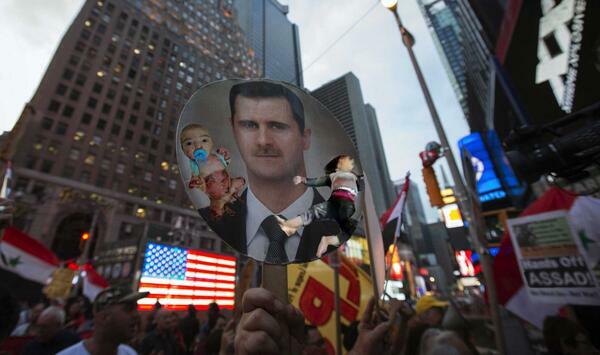 But such intimidation has failed to stop Syrians who oppose Assad from speaking out. 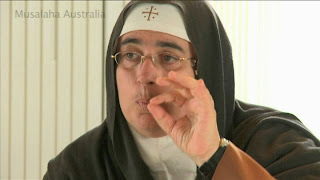 Most recently SAC has been exposing the real role and purpose of Mother Agnes-Mariam and protesting her speaking tour. They have started an online petition to Stop Mother Agnes-Mariam’s Assad Propaganda Tour or get a fair opportunity to present both sides. So far this campaign has met with good success. Venues in Northern California have reached out to SAC to provide an opposing view at the events and the Vancouver Syrian-American community was successful in having the Mother Agnes-Mariam event scheduled at the Unitarian Church in Vancouver for 11 November cancelled all together! They have also been getting more organized in Southern California and growing as a result. Since they know Mother Agnes-Mariam's reputation as an Assad Regime apologist, they know she can't be depended upon to tell people "What is Really Happening in Syria Today" so they are mobilizing supporter of the revolution to show up in numbers and set the record straight. You are invited. Arab Americans for Syria activist Johnny Achi on KPFK radio June 29, 2013 on Obama's terrorist mercenaries beheading of a Franciscan priest and his two assistants by foreign jihadists. This month has seen an escalation in sectarian atrocities committed by insurgents,(foreign mercenaries) who have been publicly armed and supported by America, Saudi Arabia, Qatar, Turkey and other actors. See CNN exclusive: Catholic monk not beheaded by Syrian rebels, friar says for an exposure of this particular Assad regime fable. According to Johnny Achi, 95% of the militants in Syria are foreign fighters. Since he is peddling this kind of mythology, the last thing he wants to see at his pro-Assad events is a bunch of Syrians who oppose Assad. "No one will be turned away"
That is what it said on the fliers and all the publicity for the IAC & AA4Syria "Eyewitness Syria" event, but when SAC members and other supporters of Assad's opposition showed up, some sporting the colors of the revolution, these Assad apologists changed their tune and tried to exclude them. In spite of promises to do it different this time, they reverted back to the same tactic some of the same forces used at an "Eyewitness Libya" event two years ago. I reported on that in No Libyans allowed at ANSWER Libya Forum. They attempted to apply shabiha tactics, including intimidation and thief, to anyone who openly opposed the Assad regime or sought to expose the fallacy of their narrow version of the "facts." They stole the revolutionary scarf of one SAC member, threaten to call the police on me and others, and tried to keep us out of a public event in a public library by bullying and physical force. In the end, it took the deployment of a Glendale police sergeant and 5 units to assure us access and keep the peace. A more personal and detailed account of events of that night has been published on Not George Sabra, Really under the title Syrian American Council and Clay Claiborne Battle LA Shabiha. The Truth Must Be Told has also posted the major presentations of the panel members to YouTube including Johnny Achi, Coordinator of Arab Americans for Syria, John Parker, West Coast Coordinator of the International Action Center, and Ramsey Clark, former U.S. Attorney General and founder of International Action Center. Mother Agnès-Mariam of the Cross is, arguably, the Christian equivalent of Shaikh Ramadan Al Bouti. She is very vocal in talking about "the foreign fighters" who came to Syria and started beheading people but she has no issue with Assad forces and sectarian gangs committing the worst atrocities against civilians since the days of Crusaders and Mongols. We don't know if she is an active paid agent for Assad propaganda masters or she is just doing this for free. One explanation is that she, like many other from the Christian minority, bought Assad's claim that he protects the minorities in Syria. She and many others from those minorities forgot that there is no future for them without the Syrian majority and we are not talking here about the Sunni majority but about Syrians who had enough of the Assad's and their affiliated gangs and who wanted their country to be free and democratic. Those are the real majority and they will prevail. Those who sided with the tyrant or preferred to sit on the fence are the real minority regardless of their ethnic or religious affiliation. We wanted to remind Mother Agnès that the tyrant uses his loyal servants for a specific reason then he dumps them. We saw how many senior Syrian officials either "committed suicide" or had "a heart attack" out of nowhere. We wanted also to remind everybody, Assad's sect included, that helping tyrants is immoral and punishable here and in the hereafter. On 26 May 2012, after the Houla massacre happened, Mother Agnès-Mariam's outlet, Vox Clamantis, issued a press release claiming that the Syrian army was not in the vicinity of Houla and did not bombard the area. "People told us that they have seen militias carrying out from the national hospital in Taldou, corpses on blankets of the Ministry of Health, carrying them to assemble them in a mosque." For example, in March, Agenzia Fides, an official Vatican publication, republished (almost verbatim) material provided by the Syrian propaganda website "Syria Truth." The article claimed that jihadists had expelled Christians from Homs. This information eventually found its way into outlets such as the Los Angeles Times. When we demonstrated the dubious veracity of these claims, Syria Truth went ballistic. A subsequent McClatchy article corroborated our refutation. Like Nizar Nayouf of Syria Truth, Mother Agnès-Mariam often assumes the slick veneer of a moderate; she even wrote an open letter to Assad about the condition of people affected by the fighting in Syrian hospitals. It's hard not to conclude that Mother Agnès-Mariam is little more than another Assad propagandist using her religious credentials to push a particular narrative. According to the Swiss newspaper Le Courrier, Agnès-Mariam was "comfortable among [Assad's] security services," and she told their reporter it was hoped he could "dismantle the propaganda of Western media." Thierry Meyssan also conducted a revealing interview with Mother Agnès-Mariam about Middle Eastern Christians. During the interview, the mother superior repeated the typically farcical Assad line that the dictator was truly trying to "reform." Why Mother Agnès-Mariam appears so strongly in Assad's corners is a matter for speculation. A flower child in the sixties, Agnès-Mariam had "a kind of revelation" in the eighties that eventually, in 1994, led her to move to Qâra, Syria "to breathe new life into an ancient monastery of the sixth century that lies in disuse." If that is the case, she may well feel that her ability to continue her life's work is dependent on her staying in the good graces of Bashar al-Assad. In the past month, the Assad regime has allowed three parties of traumatized and starved civilians to be evacuated from Moadamiyet al-Shaam, to escape the regime military’s own daily bombardment and crippling siege which has killed and injured large numbers of residents, as well as leading directly to endemic chronic malnutrition and disease among the civilian population, with a number of residents, mostly children, dying as a result, During another attempted evacuation in the same period, conducted with the assistance of known regime propagandist and ally Mother Fadia Lahham (also known as Mother Agnes Mariam of the Cross), regime forces fired directly at the waiting women and children, killing three and injuring dozens more. And now she is coming to Southern California to tell us "What is Really Happening in Syria Today." At the event, I held a sign that read, “Stop Mother Agnes Propaganda. She is an Assad Agent disguised as a Nun!” I went to the front of the audience and held the sign for all to see– including Mother Agnes-Mariam. I asked her if she was ready to denounce Assad who is responsible for killing more than 150,00 people. Before she had a chance to respond, I was attacked by three or four people who were using all kinds of profanity toward me. Two guys held my arms behind my back and one guy put his hand on my throat and they started shoving me out of the Church. At that moment, I felt like if they could’ve killed me and gotten away with it, they would have! The police were outside, but they seemed to take the side of the Assad-loyalists. I explained that Mother Agnes was a liar and that over 150,000 people are dead in Syria and I was here for peace and wanted to exercise my right of ‘Freedom of Speech’. The Assad-thugs insisted I was provoking them by holding up a sign on private property, but I responded and said I was invited by the event’s moderator, Paul Larudee. I am thinking of pressing charges against the people who violently ushered me out of the Church. I can’t believe this is happening here in our country! Now you can email Assad's nazi nun, 'Mother Agnes Mariam,' and give the frocked fascist a piece of your mind about her support of genocidal totalitarian dictatorship in (an abuse of) the name of Christianity. We would recommend creating a bogus/special address for this task; regime personnel have a habit of tracking and harassing regime critics. We have confirmed Mother Agnes-Mariam's email address is darantakia@hotmail.com. Send her videos and pictures of Assad's atrocities and let her know what you think of her. Send a copy of the email to dearmotheragnes1@gmail.com and we will post the best messages/responses here. "There's just no basis for the claims advanced by Mother Agnes," says Peter Bouckaert, emergencies director of Human Rights Watch, which has produced many detailed reports on Syria. "She is not a professional video forensic analyst... we have found no evidence to indicate any of the videos were fabricated." While Russia's motives for promoting Mother Agnes's research, regardless of its accuracy, are obvious, what motivates her? She is accused of being an apologist for the Assad regime - something she denies. But she has accused the rebels of committing atrocities before. It seems her motivation may be fear - that the Syrian government will eventually be overthrown by militant Islamist groups, jeopardising the future of the minority Christian community in the country. The first sentence ('a deal that allows him to get away with the gas murder of over a thousand people by promising never to do it again') shows the dishonest standard of this blog. Blaming Bashar for Saudi-backed terrorism - nice try, but it didn't work.